Ovulation tests can be of great help in determining your path to pregnancy. An ovulation test is a type of fertility test that detects the luteinizing hormone (LH) in a woman's urine. Ovulation tests or ovulation predictor kits (OPKs) are excellent tools for predicting ovulation, a women's most fertile time during her menstrual cycle. Apart from just confirming that ovulation has taken place, ovulation test can also help you anticipate ovulation during your menstrual cycle, thus helping you determine the most fertile time of yours. Ovulation predictor kits, Urine LH Ovulation tests: This test works by detecting the LH surge in a women's urine. A women's body generally produces large amount of luteinizing hormone (LH) immediately prior to ovulation. This generally happens during the middle of the menstrual cycle. During the menstrual cycle, only a small amount of LH is made, but in the middle of the cycle, LH dramatically increases. This increase is called LH surge. Doctors opine that a positive result on an ovulation test means that the woman will most likely become fertile over the next three days - with peak fertility at 36 hours following the LH surge. Fertility monitors: Fertility monitors are devices that help you determine your time for pregnancy. 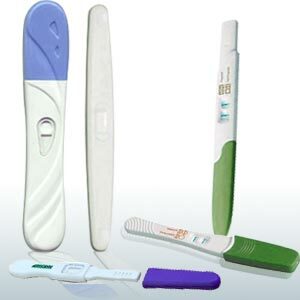 Many couples are buying fertility monitors today irrespective of its cost. Fertility monitors are costlier than ovulation predictor kits. Although the market has a variety of fertility monitors, most of them can be grouped under two categories - Saliva based and Urine based fertility monitors. Ovulation Saliva tests :When a woman is about to ovulate, her saliva begins to form a distinct fern-like pattern which can be viewed under a microscope. These patterns are formed as a result of salinity which is caused due to the increased level of estrogen in the body. Salinity produces ferns that begin to appear around three days prior to ovulation. Most women predict their fertile times by observing the visual changes that take place in their saliva using a personal ovulation microscope. The fern-like pattern formed in the saliva can be easily identified when examined under the power of a 40x to 60x magnification lens. There are many ways to determine your ovulation period. Most women prefer the home based ovulation test that are done with the help of ovulation strip or fertility monitors. Home based ovulation strips, which are found to be highly reliable, detect the LH surge by chemically analyzing a urine sample to detect the amount of LH present. Specimen collection: Fill a sterile container with urine. Collect urine once per day during your menstrual cycle between 10.00 AM and 8.00 PM. Remember, not to use first morning urine sample, since they are not effective in determining the LH surge. You can store the urine if required. However, for best results, test the urine on the same day it is collected. Urine samples may be stored at room temperature (15º-28ºC) for up to eight hours, or in the refrigerator for up to twenty-four hours. Do not freeze the urine sample. Best time to test: To do an ovulation test at home, you need to understand and be able to determine the length of your menstrual cycle. The length of the menstrual cycle is the number of days from the starting day of your last month period (LMP) to the day before bleeding begins on the next period. In other words, it is the number of days between your LMP cycles. Before starting an ovulation test with ovulation strips, determine your usual length of the menstrual cycle for the last few months. Then, refer to the Ovulation Calendar Cycle Chart below to determine on which day of the menstrual cycle to begin testing. If your cycle is less than twenty-one days or greater than forty days, consult a physician. Remove the ovulation strip from the pouch. Carefully, dip the end of strip into the sterile urine container for 5 seconds. Then, lay the strip flat on a clean, dry, non-absorbent surface. Watch for the urine levels in the strips. Do not allow the urine level to exceed the line indicated as MAX line in the strip; else it might fetch inaccurate results. Once collected, wait for colored bands to appear on the strip. This might happen in 40 seconds of urine collection. Within three to five minutes, two color bands will appear on the ovulation strips. Comparing the color intensity of these bands to the control band, helps you determine your ovulation period. Result 1: A test band indicating your LH surge is usually equal to or darker in color than the control band. This is a positive indication that you are ovulating. Remember, light test band color does not indicate positive result, since there is always some amount of LH present in women's urine. Result 2: The ovulation test result is considered negative when the color in the test band is lighter than the control band. This indicates that LH surge is not in progress and the hormone is still at base level. Chances of invalid test result is very rare, however it happens when control band does not appear within five minutes. Doctors suggest that six to ten days of testing may be needed to detect the LH surge. Continue the test as prescribed by your doctor and determine at each test whether you are having LH surge. Ovulation is most likely to occur sometime in the day and a half following the first day of the LH surge. Do not be disappointed if your test result is negative. Keep continuing your test as per doctor's advice to determine when the LH surge is happening within you. Remember few precautionary steps like reading the instructions page before using any ovulation tests. Do not take the test on your own; consult with your doctor before doing the same even at home. Because, few medications like menotropins, danazol or fertility drug clomid may skew the result. Ovulation test is useful in determining your fertile period. When these tests are used along with other fertility predictors such as BBT, cervical mucus and cervical positioning, you will begin to see the pattern of your menstrual cycle. A better understanding of your menstrual cycles and other bodily intricacies will ultimately help you achieving pregnancy.